The National Railroad Passenger Corporation, also known as Amtrak, is an American publicly funded and operated passenger railway. Amtrak was founded in the early seventies by Richard Nixon in order to protect the private railroads (today's Class I freight railroads) from their obligation of having to run money-losing passenger routes. It was officially founded as a "for-profit entity", which is laughable considering neither the Highway Trust Fund nor the Federal Aviation Administration (FAA) were ever in the black. Nixon created Amtrak with the intention of shutting it down immediately after it showed to be unprofitable—demonstrating once and for all there was no demand for passenger trains. The public was not fooled and Congress soon established an operation subsidy to keep Amtrak running. Said subsidy however has been perpetually sub-optimal, and Amtrak has always fought hard for the meager grants it gets whereas cars and planes receive princely sums in comparison without much asking. This results from the vision that is common in the twentieth century that the United States was a country of the automobiles. Consequently, "deferred maintenance" and trains dating from before the foundation of Amtrak may be found even today, in the twenty-first century. Unfortunately, the inability to upgrade deteriorating infrastructure when it has reached the end of its useful lifespan will only add to the total costs of operation, maintenance and repairs. Delays will be all too common. Since 2000 however, onerous security for planes (a result of 9/11 and security theater), rising gas prices, and continued popularity of both the Acela Express[note 1] and Auto Train lines meant rising ridership year after year; with total rise of 50% in 2013 compared with 2000. California subsidizes its (hugely popular) Amtrak routes and has also seen record ridership year after year. The Gateway Project is a plan to modernize railroad infrastructure between New York and New Jersey and to double the number of trains passing between those two states. This plan includes the repairs to the old North River Tunnel, and the construction of the new Hudson Tunnel. Existing tunnels between New Jersey and New York are over a century old and were seriously damaged by Hurricane Sandy in 2012. They are currently operating at full capacity, as are the bus terminals. They are owned by Amtrak but is also used by New Jersey Transit. If these tunnels were not thoroughly repaired and a new tunnel were not built on time, the number of trains crossing the Hudson River during rush hours could drop from 24 to just six, with dire consequences for the regional economy. In fact, the Northeast Corridor is the most heavily traveled railway in the nation. The Obama administration tried to fund the project, but ran out of time. Under the Obama plan, the federal government would provide 50% of the funding, and the rest would come from the state governments of New York and New Jersey. They failed to raise enough money. Although he was initially in favor of the Gateway Project, Trump later turned against it and urged fellow Republicans to cut funding for it. It appears Trump wanted to use this crucial infrastructure project as a bargaining chip with Democrats. A major part of Amtrak's vision for the Northeast, which includes a high-speed rail service (more below), is the revitalization of Washington Union Station. This massive makeover will double passenger capacity, improve accessibility, and enhance passenger experience. Washington Union Station serves the Washington Metro, D.C. buses, the Maryland Rail Commuter (MARC) and the Virginia Rail Express (VRE). Some 100,000 passengers use this station daily. Construction is scheduled to begin in the fall of 2019. This comes at a time when private investors are considering a regional maglev train service. Amtrak - as opposed to railways in almost all developed countries - does not own its tracks[note 2] and instead has to lease them from freight railroads. Exceptions to that are small pieces of track here and there as well as (most of) the Northeast Corridor. The freight railroads don't give a crap about Amtrak and would much rather have them off their tracks and as such tracks are often badly maintained and cannot cope with speeds above 79mph - a speed that steam trains already beat at the turn of the 19th to the 20th century. To add insult to injury, most of America's railway network is single-tracked and non-electrified (as opposed to those of countries in Europe and East Asia) and Amtrak trains frequently have to wait for hours on end to let freight trains pass. All this could easily be fixed by investments in rail infrastructure, buying up tracks or simply one or two laws that might marginally diminish the profits of private freight railroads - or in other words it does not have a snowball's chance in hell of ever happening. Another issue is that FRA (Federal Railway Administration) regulations are notably different from international regulations, making it difficult to buy "off the shelf" trainsets from international manufacturers and thus driving costs. The Northeast Corridor is the only major portion of tracks actually owned by Amtrak (and some state and commuter rail entities) and as such trains are faster than elsewhere, reaching 150mph on some stretches (the trains are capable of more, but the track, which is in dire need of investment, can't support it) and thus almost playing in the same league of high speed rail as the Shinkansen (from Japan) or TGV (from France) (200mph max. speed in daily operation). Amtrak’s long-distance routes, while often painfully slow, are good for sightseeing (as opposed to the same overpasses and paved over paradise you see from the Interstate) and feature sleeper cars and edible food (compared to airline fare at least). Amtrak provides good value for tourists with time on their hands and stops in such obscure places as Harper's Ferry (which of course is wholly or in part due to the above-mentioned Republicans lobbying for a train through their state while wishing to shut down Amtrak) providing a much-needed injection of tourist dollars in the local economy. Some states have decided that the federal government just does not know what is good for them; Washington, California, Illinois and even some "red states" fund their own Amtrak routes and track improvements. Consequently those states have better equipped faster trains that run more frequently and California for one has posted record ridership numbers year after year in the last decade, as has the Pacific Northwest. High-speed railroad map of the United States in 2013. As far back as the Lyndon Johnson administration, American presidents have advocated HSR, but all have failed in the face of the car lobby and anti-train Republicans. An attempt made by Bill Clinton quickly fizzled out, mostly thanks to Southwest Airlines lobbying. A HSR project in California was approved by voters in 2008, after governor Jerry Brown first proposed it at the end of his second term in the 1980s (Brown is one of the biggest proponents of HSR in the state). It's immediately obvious why California needs HSR for two reasons: increasing highway congestion, and because most major arteries cannot be widened. The money they already pour into road maintenance is huge. A complete system, with high-speed links between cities and fleshed-out subway, tram and bus systems within cities, is essential to getting public transit to work. The current rail system is vastly underused by the majority of Californians. It's a chicken and an egg problem that California hasn't yet sorted out. Interestingly, but not surprisingly, entrepreneur Elon Musk declared that driverless cars will make high-speed trains obsolete. Musk is also a proponent of the Hyperloop concept, which competes with HSR but is not yet a mature technology. “”It's like the equivalent of putting the Berlin Wall down the middle of Ellis County. It's just an immovable project. There was a plan for Amtrak direct from Dallas-Houston, but that was driven into the ground 5 years ago. Union Pacific demanded that the new set of Amtrak-exclusive tracks be 40 feet away from the existing tracks, which is damn near impossible. Their inability to negotiate and provide practical solutions is the reason why you can't take a train from Dallas to Houston, and now from San Antonio to Georgetown. A former Bush administration official promoted a bullet train linking Dallas and Houston. This entire line pits Dallas and Houston vs. the rest of the state. There have been two bills to kill it: the first bill was introduced by Byron Cook. He represents rural counties it would pass through (Navarro, Freestone). The second was introduced by John Wray, who represents Ellis County—not unsurprisingly a rural county bordering Dallas County through which the line would run. These are men with actual constituent interest in killing the line. The automakers did not care much as the increase in car rentals could offset the losses. Even Southwest Airlines was playing a "wait and see" game with the new corridor; the company is diversifying right now expecting that they will make less profit flying people between Houston and Dallas. However, the majority of Texas residents believed would not benefit from the line, and the rural dwellers refused to pay for it. Proposed high-speed railways for the United States, with connections to Canada (2001). President Barack Obama made high-speed rail part of his massive economic stimulus package of 2009. However, in 2010, the governors-elect of Florida,[note 3] Wisconsin and Ohio all rejected high-speed rail projects and the funds were redirected to other states, including California, which made the most progress with its plans for high-speed rail. Yet, ironically, Scott Walker of Wisconsin requested more funds for the extremely popular Hiawatha Service connecting Chicago and Milwaukee. Moreover, this decision by Walker resulted in the Spanish-owned train-building company Talgo leaving Wisconsin for Illinois, taking with it 125 jobs. John Kasich of Ohio frankly remarked that (high-speed) passenger rail is not in the future of his state. But this is a shame because the 3C Corridor (Cleveland-Columbus-Cincinnati) is one of the nation's most promising routes. In 2015, Japan's engineering giant Mitsubishi Heavy attempted to export its futuristic L0 Series superconducting magnetically levitated train, whose maximum operational speed is 505 km/h (316 mph), to the U.S., eyeing to connect Dallas and Houston in Texas and also Washington, D.C., and Baltimore in the Northeast. Technological excellence aside, its cost is enormous and despite the backing of Prime Minister Shinzo Abe, it never received sufficient support in the U.S. What makes the offer even more enticing is that the U.S. will not have to pay license fees and that Japan will provide substantial financial support. Negotiations stalled in 2017 due to the Trump administration's unclear stance on high-speed rail. In Minnesota, the proposed Zip Rail link between Rochester and the Twin Cities (Minneapolis-St. Paul) was canceled in 2016 due to a lack of funding for the study of alternatives. Recent developments in high-speed rail in the United States are a mixture of both public and private investments. The Acela Express has a top speed of 150 mph (240 km/h). America's first high-speed railway goes along the Northeast Corridor (connecting Washington, D.C., Baltimore, Philadelphia, New York City, New Haven, and Boston) where the Acela Express service has a top operational speed of around 150 mph (240km/h). Current Acela train sets will be replaced by the Avelia Liberty,[note 4] which will will be even faster. The Avelia Liberty, designed by Alstom, is an actively tilting train, allowing it to increase speed along curved tracks without consuming more electricity or disturbing passengers; it is expected to enter service in 2021. These new trains will come equipped with more passenger capacity, USB ports, power sockets, WiFi, accessibility features, and other conveniences. In 2018, Amtrak announced $370 million in investments over a period of three years on new equipment and infrastructure to improve service along the Northeast Corridor. A Brightline train at Fort Lauderdale Station. America's second high-speed railway is in Florida . Its first segment, between Fort Lauderdale and West Palm Beach, opened in January 2018. Service to Miami began in May of the same year. Funding for Phase II, which extends service to Orlando, has been approved. This high-speed railway is owned by the private company Brightline. Its rolling stock consists of diesel-electric locomotives (SCB-40) with a top speed of 200 km/h (125 mph) from Siemens; WiFi, power sockets, bicycle and pet-friendly luggage space are available. Besides new and comfortable trains traveling on their own tracks and arriving on time, the Florida Brightline also features modern train stations, and good customer service. In November 2018, Brightline signed a partnership agreement with Sir Richard Branson's Virgin Group, and renamed itself Virgin Trains USA. The Texas Central Railway , currently under construction, will go from Houston to Dallas. Although there are no plans for San Antonio and Austin just yet, the Dallas-Houston line could serve as the backbone for future projects. The Texas Central Railway will use a variant of the N700 Series bullet trains from Japan, with a top speed of 205 mph (330 km/h), though service is more likely to start at 186 mph (298 km/h), which is fast enough to go between the two cities in just 90 minutes. Texas Central is a private railroad company. The Texas Central Railway is expected to enter service in 2024. In October 2018, Texas Central signed an agreement with Renfe, in which the Spanish national train operator will assist in the operation and maintenance of the Houston-Dallas railway. The California High-Speed Rail (CHSR), owned by the California High-speed Rail Authority, is intended to link eight out of ten major cities of the Golden State. Phase I, the Los Angeles-San Francisco line, 800 miles (1280 km) in length, is expected to be completed by 2033. Construction is going ahead at full speed. Trains will take under three hours to go from San Francisco to the Los Angeles basin traveling at speeds of 200 mph (320 km/h) or faster. Phase II, which will connect Madera to Sacramento and Los Angeles to San Diego, is being planned. However, the project's future remains in doubt due to dwindling public support and strong opposition from Republicans, citing cost overruns and engineering challenges. At present, the project is estimated to cost 100 billion dollars. [note 6] Part of the reason why the CHSR has become so expensive is the large number of lawsuits and settlements. In an attempt to halt construction of the CHSR, opponents of the project spread a rumor that the devastating wildfires of late coincide with the proposed route, implying that the railway is the cause. This is demonstrably false; if it were true, the entire cities of San Francisco, Los Angeles, San Jose, San Francisco, and Sacramento would be consumed by fire, which did not happen. The maps of the wildfires and the proposed CHSR route do not line up at all. Unfortunately, a government audit reveals that the cost of this project is unjustifiably high due to poor planning by the California High-speed Rail Authority. For example, the Authority decided to proceed with the project before land acquisition is complete. In 2017, the Washington State Department of Transportation announced it is conducting a feasibility study of a bullet train service with a dedicated railway from Portland, Oregon, to Seattle, Washington, and then to Vancouver, British Columbia, Canada. This study is supported by Microsoft, which has an interest in a smooth high-speed rail link between the cities, where its employees are based. The current Amtrak Cascades service has a top speed of only 79 mph (126 km/h) and has to share tracks with freight trains. This constitutes the Pacific Northwest Corridor. [note 7] Also welcomed by the Province of British Columbia, construction of the corridor, whose annual ridership could reach two million, could begin in 2025 and take nine years to complete, generating up to 200,000 jobs. Microsoft and labor unions estimate that it will cost between 24 and 42 billion U.S. dollars. Amtrak's next generation of high-speed trains are coming soon! All aboard the Freedom Train! This Future Map Of The United States Is Way Cooler Than Any Current Map Of The United States. I like trains and America is my city! A vision for high-speed rail in Illinois. NPR at Illinois State University. California State Rail Plan – Executive Summary. California Department of Transportation. ↑ One of the few high speed trains in the US; it connects D.C. to Boston via New York City. ↑ In some developed countries the tracks are owned by the government or some quasi-state-owned entity such as Network Rail in the UK while the trains are private, however in most of those places the government de facto sets railroad policy and decides which train runs where and how. ↑ In Florida there even was a state constitution amendment that mandated HSR for the state, which was repealed on the initiative of one certain Jeb Bush. ↑ Once this is completed, the XpressWest line can link with the Chicago Hub Network by a rail line going from Denver to Kansas City. ↑ For comparison, the Tokyo-Osaka line via Nagoya with a total distance of about 438 km (274 miles) has a price tag of about 75 billion dollars and is projected to be completed by 2045. ↑ If given the green light, this could be the first international high-speed rail connection outside of Europe. ↑ To see the massive potential that Chicago has as a transportation hub for the Midwest, see the Cross Rail Chicago proposal, aimed at linking the Northwest and South sides of the city for airport express, regional commuter and inter-city high-speed trains. The Cross Rail, if built, will be the linchpin of the future high-speed rail hub. Furthermore, the Chicago O'Hare International Airport is the second most connected in the world (behind London Heathrow), the best connected in the U.S. and the sixth busiest in existence. ↑ Unique, nonstop train line between Lorton, VA and Sanford, FL. It allows passengers to bring their cars with them on the overnight trip. ↑ 5.0 5.1 Obama Administration Urges Fast Action on New Hudson River Rail Tunnels. The New York Times. May 7, 2015. Accessed February 10, 2019. ↑ Union Station prepares for a concourse makeover. The Washington Post. January 12, 2019. Accessed February 11, 2019. ↑ What Is High-speed Rail?. International Union of Railways (UIC). ↑ The Development of High Speed Rail in the United States: Issues and Recent Events. Federation of American Scientists (FAS) December 20, 2014. ↑ Robrt Cruickshank, "CA Chamber of Commerce Out to Lunch on Congestion Mitigation", CHSR Blog. ↑ Chris Knight, "California's High-Speed Rail Realities". ↑ Matt Johnson, "Musk's Hyperloop Math Doesn't Add Up". ↑ Tanya Eiserer, "Communities on route to Houston oppose high-speed rail", ABC. ↑ Amy Crawford, "The Big Texas Plan to Copy Japan's High-Speed Rail Success", The Atlantic. ↑ Eric Jaffe, "Southwest Airlines Hasn't Decided Whether or Not to Oppose Texas High-Speed Rail", Atlantic. ↑ No High-Speed Rail Funds for Two States That Don't Want It. Webarchive link. ↑ 22.0 22.1 U.S. yanks high-speed rail funds for Wisconsin and Ohio. Reuters. December 9, 2010. ↑ Ohio Governor-elect: "That train is dead." Trains Magazine. November 5, 2010. ↑ Japanese rail company eyes exports to cover maglev costs. Nikkei Asian Review. April 22, 2015. ↑ Mitsubishi Heavy to back out of maglev train project. Nikkei Asian Review. April 11, 2017. ↑ MnDOT suspends its work on Zip Rail project. Minnesota Department of Transportation. News Release. January 27, 2016. ↑ A Look Inside Alstom’s Avelia Liberty. Railway Age. August 8, 2018. ↑ Amtrak to improve Northeast Corridor with $370 million. Global Railway Review. July 30, 2018. 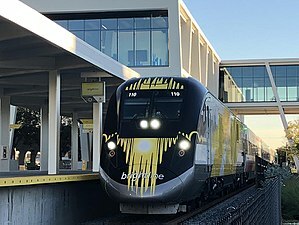 ↑ Brightline slates fares and service date. Railway Age. January 11, 2018. ↑ Brightline’s inaugural West Palm-to-Miami trip draws crowd, celebration , My Palm Beach Post. May 19, 2018. ↑ Brightline: On to Phase 2? Railway Age. September 5, 2018. ↑ Brightline unveils Siemens locomotives and coaches. Railway Gazette. June 8, 2016. ↑ The Future Of High Speed Rail Travel In Florida Is Bright. Forbes. October 26, 2018. ↑ Brightline to rename itself as Virgin Trains USA due to strategic partnership. Global Rail Review. November 19, 2018. ↑ Houston-to-Dallas Bullet Train's Start Date Pushed Back Again [UPDATED]. Houston Press. February 7, 2017. ↑ Renfe and Texas Central sign agreement for the Houston-Dallas high-speed project. Global Railway Review. October 31, 2018. ↑ Brightline to build new rail corridor connecting Southern California and Las Vegas. Global Railway Review. September 20, 2018. ↑ Everything you need to know about California's high speed rail project. Sacramento Bee. November 15, 2018. ↑ 43.0 43.1 A $100 Billion Train: The Future of California or a Boondoggle?. The New York Times. July 30, 2018. ↑ Draft 2018 Business Plan. California High-Speed Rail Authority. March 9, 2018. ↑ Judge Tentatively Tosses Bond Arguments Against California High-Speed Rail. CBS Sacramento. October 25, 2018. ↑ Do Recent Wildfires Match Up “Exactly” with California’s Proposed High Speed Railway?. Snopes. November 15, 2018. ↑ California High‑Speed Rail Authority: Its Flawed Decision Making and Poor Contract Management Have Contributed to Billions in Cost Overruns and Delays in the System's Construction. Auditor of the State of California. Accessed January 29, 2019. ↑ By Bullet Train From Portland To Seattle To Vancouver, BC? Feasibility Study Underway. KUOW. July 26, 2017. ↑ Horgan puts up $300,000 to keep concept of Vancouver-Seattle-Portland high-speed rail alive. Vancouver Sun. March 17, 2018. ↑ St. Louis-Chicago Amtrak route to get faster, more reliable, state says. Chicago Tribune. December 26, 2017. This page was last modified on 12 February 2019, at 00:12.